It is hard to resist a donut. Coupled with their irresistible taste and high cute factor, you can understand why these single serving delights are making an icing-dipped splash as the latest event trend. The ring is the most recognizable shape of these little, tasty pastries but they are also easily adapted to fit your sugary needs. 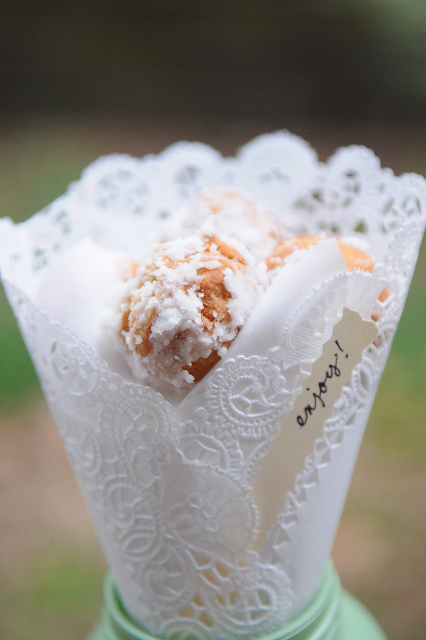 So when planning your event, think about all the interesting variations that the donut offers: twisted, filled, frosted, powered, holed or sprinkled. Available in all sorts of flavors, they can be tailored to fit your party theme, color or vignette. Served on pretty china, they are the instantly upgraded to fancy desserts for baby showers and tea parties. Stacked in tiers they can rival any traditional wedding cake. Put them on sticks and they are transformed to fairground confections. Tied with homemade bows, they can be bagged and given out as whimsical party favors. 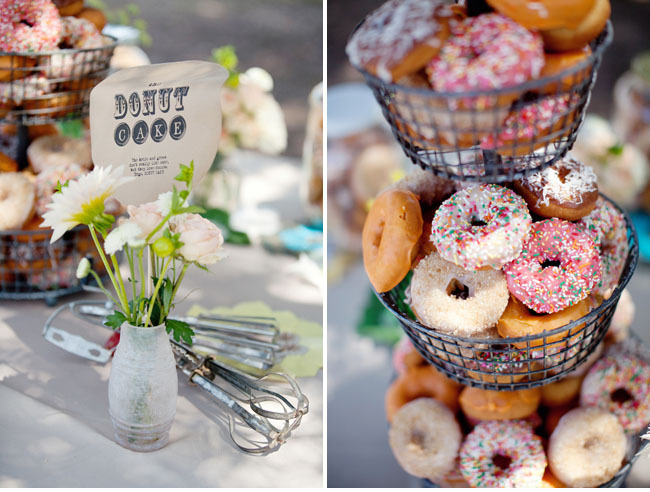 And who wouldn’t like to ante up to a donut bar and throw back a few? Mix patterns, textures, prints, and colors through your bridesmaid dresses and accessories. 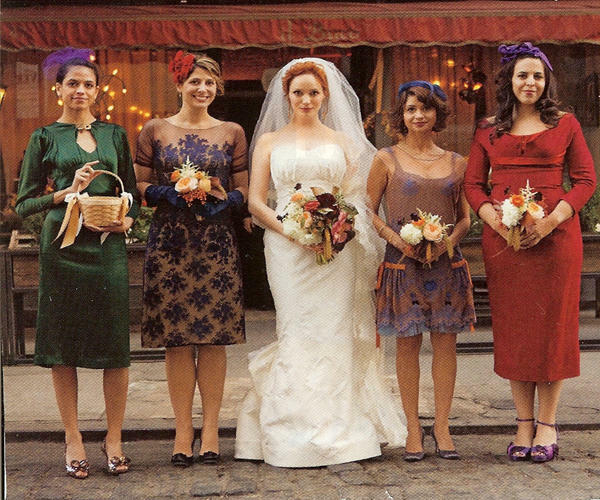 Similar to how Mad Men star Christina Hendricks did above at her wedding. 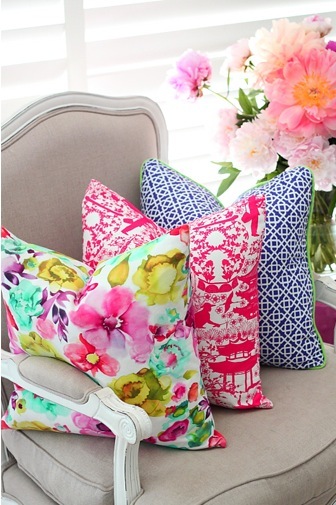 Add multiple patterns with pillows in a reception lounge area. Don’t be afraid to tie in the latest trends at your wedding. 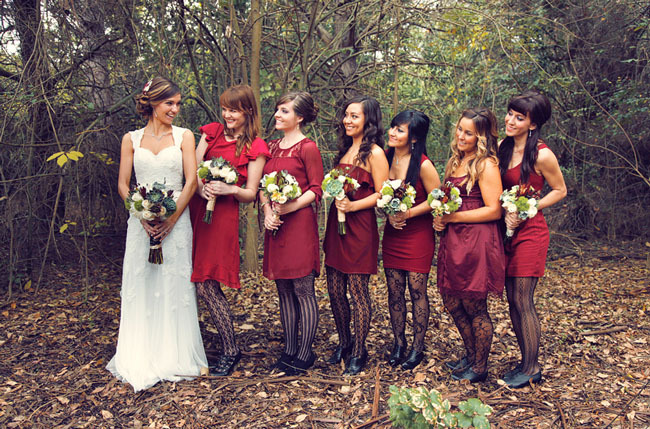 The bride above had her bridesmaids mix patterns through their tights! Very creative. 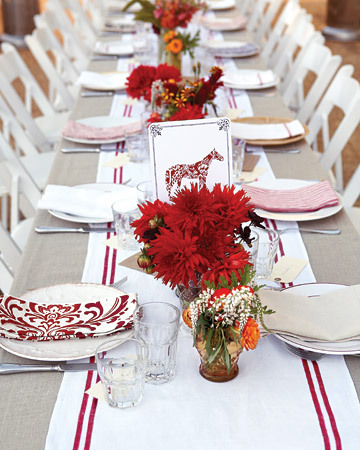 This simple red and white table above shows how easy it can be to mix patterns and colors through your napkins. Have the groom or groomsmen mix patterns with their vests, ties, and shirts. 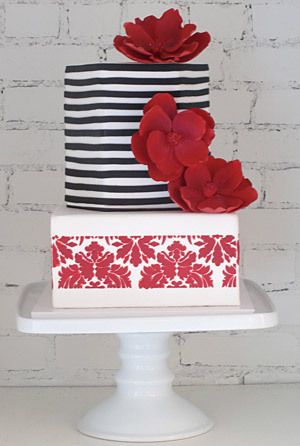 Mix patterns on each tier of your cake. This parisian inspired cake screams elegance and class! Once you’ve returned your RSVP card to an afternoon tea party it’s time to decide what to wear. Whether this is your first tea or you’re a seasoned veteran here are some tips and reminders! 1. 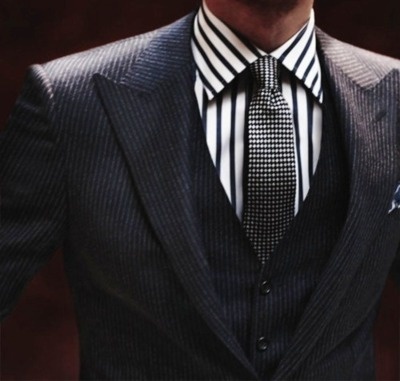 A dress or pants-suit is a great base to your outfit. Choose a color and style appropriate for the season and your age. Spring and Summer tea parties tend to be more informal, while Autumn and Winter teas are more formal. 2. Read your invitation for specific accessory requirements. Do you need to wear a hat? Gloves? Is it a playful or children’s tea party where costume jewelry is encouraged? If there are no special requirements we suggest finding authentic vintage pieces to accompany your outfit. 3. For an outdoor tea party wedges and flats are the practical footwear choice. 4. Bring a light jacket, sweater, or shawl. If the tea is formal, exposing your arms might be considered taboo. The weather or air conditioning could also create a chilly environment; this way you’ll be prepared! 5. Wear a smile and bring a positive attitude. You’ll surly meet new people at the tea and will want to make a great first impression. Foraging for herbs and veggies seems to be all the rage these days, especially in high end restaurants like Daniel in NYC. That got me thinking, why not forage for flowers for events and weddings? There are so many pretty flowers that grow wild–even those that were once considered weeds, like Queen Anne’s Lace (love, love love!). So when I visited my in-laws in Coeur D’Alene, Idaho I couldn’t resist giving it a try. It certainly doesn’t hurt that they have lambs ear growing wild everywhere! Check out this great bouquet that I picked while taking a walk around their house! Not too shabby. Since many of us (at least younger Americans) did not grow up having “afternoon tea,” some clients have asked for etiquette guidelines for tea parties. So, I found a great (and humorous) Emily Post book “Etiquette” published in 1922 talking about all aspects of the tea party. I’ll post it in parts starting with tea party invitation wording because her guidelines are pretty long. Take some of this with a grain of salt (or sugar! ), especially the “servants” and “Best Society’s” parts! Please note that this is what was considered proper and tea parties then– today, afternoon teas do not have to follow strict guidelines. Invitations to a tea of this description are never “general.” A hostess asks either none but close friends, or at most her “dining” list; sometimes this sort of a “tea” is so small that she sits behind her own tea-table—exactly as she does every afternoon. But if the tea is of any size, from twenty upwards, the table is set in the dining-room and two intimate friends of the hostess “pour” tea at one end, and chocolate at the other. The ladies who “pour” are always especially invited beforehand and always wear afternoon dresses, with hats, of course, as distinguished from the street clothes of other guests. As soon as a hostess decides to give a tea, she selects two friends for this duty who are, in her opinion, decorative in appearance and also who (this is very important) can be counted on for gracious manners to everyone and under all circumstances. If the latter, she deluges it with hot water, and again watching for the guest’s negative or approval, adds cream or lemon or sugar. Or, preferring chocolate, the guest perhaps goes to the other end of the table and asks for a cup of chocolate. The table hostess at that end also says “Certainly,” and pours out chocolate. If she is surrounded with people, she smiles as she hands it out, and that is all. But if she is unoccupied and her momentary “guest by courtesy” is alone, it is merest good manners on her part to make a few pleasant remarks. Very likely when asked for chocolate she says: “How nice of you! I have been feeling very neglected at my end. Everyone seems to prefer tea.” Whereupon the guest ventures that people are afraid of chocolate because it is so fattening or so hot. After an observation or two about the weather, or the beauty of the china or how good the little cakes look, or the sandwiches taste, the guest finishes her chocolate. If the table hostess is still unoccupied the guest smiles and slightly nods “Good-by,” but if the other’s attention has been called upon by someone else, she who has finished her chocolate, leaves unnoticed. If another lady coming into the dining-room is an acquaintance of one of the table hostesses, the new visitor draws up a chair, if there is room, and drinks her tea or chocolate at the table. But as soon as she has finished, she should give her place up to a newer arrival. Or perhaps a friend appears, and the two take their tea together over in another part of the room, or at vacant places farther down the table. The tea-table is not set with places; but at a table where ladies are pouring, and especially at a tea that is informal, a number of chairs are usually ready to be drawn up for those who like to take their tea at the table. In many cities, strangers who find themselves together in the house of a friend in common, always talk. In New York smart people always do at dinners or luncheons, but never at a general entertainment. Their cordiality to a stranger would depend largely upon the informal, or intimate, quality of the tea party; it would depend on who the stranger might be, and who the New Yorker. Mrs. Worldly would never dream of speaking to anyone—no matter whom—if it could be avoided. Mrs. Kindhart on the other hand, talks to everyone, everywhere and always. Mrs. Kindhart’s position is as good as Mrs. Worldly’s every bit, but perhaps she can be more relaxed; not being the conspicuous hostess that Mrs. Worldly is, she is not so besieged by position-makers and invitation-seekers. Perhaps Mrs. Worldly, finding that nearly every one who approaches her wants something, has come instinctively to avoid each new approach.